Kentz Group has been delivering top-quality services to leading international clients in all sectors of industry and commerce since 1919. With an extensive track record in executing projects of the highest quality, to agreed schedules and within budget; we are totally dedicated to innovation and excellence in the provision of all our services. 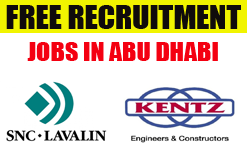 SNC-Lavlin Kentz Field Operations, One of the leading engineering and construction groups in the world and a major player in the oil and gas construction markets is currently hiring for below position based in Abu Dhabi. All positions are located at SNC Lavlin Kentz Field Operations project site in Abu Dhabi. Besides an attractive package, Company shall provide accommodation, food allowance etc. Please send your resume by email to: charu.sharma@snclavalin.com mentioning the position applied for in the subject line.